If I have any chance of getting in 5 fruits and veggies a day, I needed to figure out a way to incorporate some into my breakfast. As with most of my ideas, I try to get Andy on board because then it means I might actually follow through for more than a week. 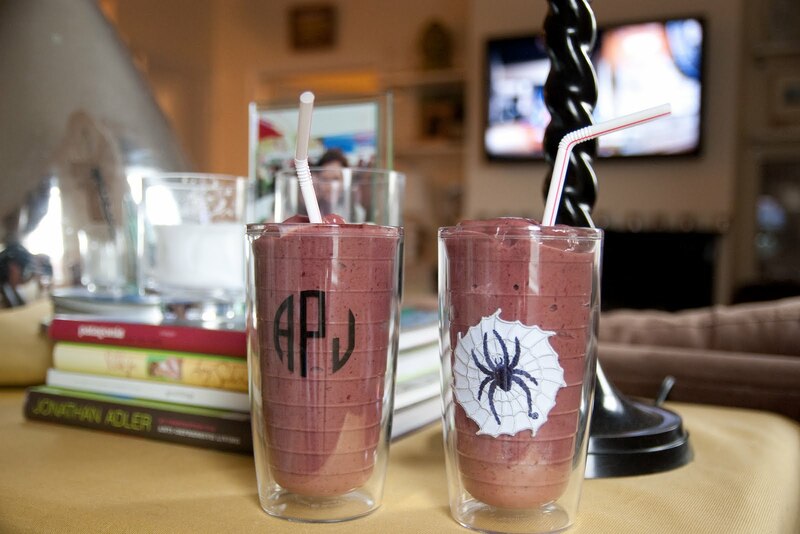 A few weeks ago, I started making smoothies for us in the morning. The recipe was trial and error, but I settled on the proportions that taste good to us. By the time we get to work, we've already checked off two fruits and veggies for the day. 3 spinach ice cubes* (update) or 160g Frozen Chopped Spinach... much easier than making your own! Combine ingredients in a blender, add water to get it going (I usually add up to the 2 1/2 cup mark) and blend away until creamy and smooth. I included the weights of most of the ingredients because that's how I make these and think it's far easier than dirtying up lots of measuring utensils. Just put the blender pitcher on the scale, tare, add an ingredient, tare, etc. But I included approximate volumes for those that haven't seen the food scale light yet. *What are spinach ice cubes you ask? Well, this is my way of getting the spinach into the smoothie with as little of a trace as possible (and it makes things quicker in the mornings). 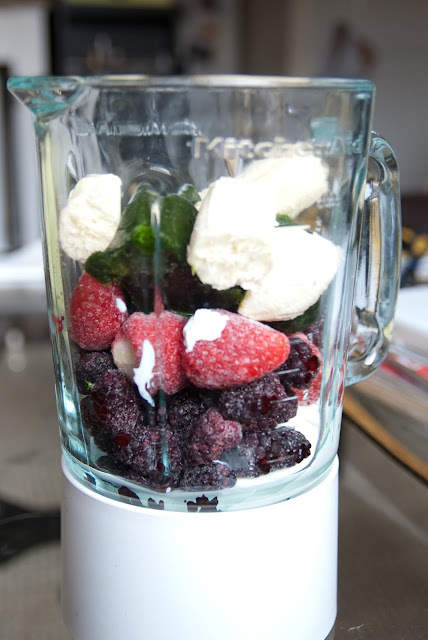 To make, take one 16oz tub of baby spinach, put a few handfuls of it into the blender, add a little water to get things moving and then blend away, adding the rest of the spinach until everything's liquefied. Poor the concoction into an ice cube tray and put it in the freezer. I store the frozen cubes in a plastic bag until I'm ready for them.